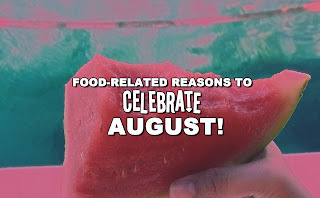 Celebrate for Food Days in August Are Here! I thought I'd grab hold of list of celebrations related to food and post them into one place. August Food Day Celebrations We have so much to celebrate this August. Apart from it being the Higalaay Festival Month of my hometown, Cagayan de Oro City, it also has a long list of varied food celebrations. ——— Disclaimer: Most of these food celebrations may be American in origin but in my opinion food can be celebrated by all civilizations. Hurrah!